Hi! Did you end up here because you did a search for the word “sheitel” or something sheitel related? Welcome! I don’t actually talk about sheitels all that much on this blog (except for this post, which you should totally read), but I do talk about other things, like a lot about motherhood, a little about marriage, a lot about Jewish topics, and then some random other stuff. Stick around for a minute, check it out, and if you like what you see, you can sign up for new posts to come via email (in the sidebar there). I also have a Facebook page for my blog, an Instagram account, and I write regularly for Hevria. So let’s hang out wherever works for you. Sheitel or tichel? Snood or pre-tied? Band fall or hat fall? If these choices don’t mean anything to you, you’re in good company. They didn’t mean anything to me before I delved into the world of Orthodoxy. Today I’m going to talk about my experience with my sheitels. A sheitel, a wig, a faaaaaabulous wig. The subject of much discussion in Yeshivish circles. How to wear it, how often to get it done, how long it should last. Because of sheitels, I’ve seen grown women duck and cover speedily at the first droplet of rain. I’ve seen gorgeous, layered sheitels, falling near to the middle of a woman’s back. I’ve seen sheitels that are the epitome of practicality, with nary a nod to fashion. Sheitels so expertly blended with real hair that one would honestly never know it was a sheitel. Sheitels which clearly do not match the original, as a shock of hair reveals. 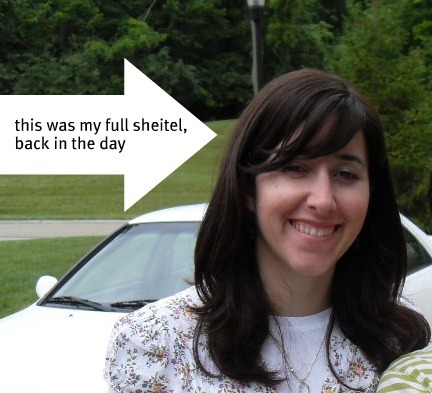 I purchased my first sheitel when I was engaged, and spent around $1400. It was the first one I tried on, which is great mazel, or so everyone told me. It was cut and styled beautifully by the sheitel macher who sold it to me, and when she was finished I walked out of her salon with glamorous curls and long, side-swept bangs. I felt marvelous, I felt beautiful, I felt … anxious. This was my first exposure to sheitel style anxiety. From the time the sheitel was styled, I felt a crushing anxiety that I shouldn’t mess up the coiffure, that it should stay PERFECT. And I felt this anxiety every time I would get my sheitel done. It was really aggravating. Eventually, I learned that I should stick with uncomplicated styles, which tend to look decent for a while, and are less disappointing when they “fall.” Also, I just learned not to take my hair too seriously. It was not worth the stress. About six months or so into marriage, I purchased a second sheitel, a band fall. This is a sheitel without bangs, worn with a fabric band, or scarf, or whatever. It’s about half the price of a “full” sheitel (that’s the one with bangs), and I assigned the fall to be my weekday sheitel, saving my full, more expensive one, for Shabbos and Yom Tov. nice and laid back. and half the cost. It took me a while before I felt comfortable with my sheitels, but I’ve finally gotten there. I purchased a new full sheitel when we moved to Baltimore, and I absolutely love it. It’s very comfortable, not too much body, it wasn’t a fortune (okay, not a fortune for a sheitel), and I got a simple cut which works for me. I feel like it’s the fruit of four years of struggling with my sheitels – I knew what to look for when I was shopping for one. Generally, I wear my sheitel when my husband is around, when I want to be incognito, or if I just feel like it would look better with my outfit. So I don’t wear one everyday, and sometimes I go a couple days without donning one. Other times I’ll find myself wearing one so constantly that I start to get tired of it. It just depends. When I’m not covering my hair with a sheitel, I’m covering it with other things, but we’ll get to that later. When I was newly, newly married, I worked in a office. My boss was an Orthodox guy, but I was the only other Jewish employee, and I was basically the only other Jew that my co-workers had any interaction with. They didn’t know about the whole covering my hair with hair thing. Eventually, one of my co-workers complimented me on how my hair looked perfect every day. “Oh, this?” I said. “It’s a wig.” I saw her face quickly turn crimson. “For religious purposes, um, mumble bleargh….” I trailed off. I realized that I should probably think of a considerate, intelligent explanation for why I was wearing a wig. I still feel bad that my attempt at a nonchalant response made her so embarrassed. One of my other co-workers didn’t believe that it was a wig, so she came up right to my head and inspected. Yes, it is a little unbelievable. Ten years ago, I wouldn’t have believed that I would be covering my hair with a wig, but, here I am. I don’t have to try hard to look nice. I can just put one on and BAM! Instant polish and coif. I cannot overstate how awesome that is. The only thing I use my hairdryer and flat iron for is entertaining my kids. I feel comfortable that all my hair is really covered. With tichels and hats and other coverings, I feel like there’s always some hair peeking out somewhere, and I’m constantly adjusting and tucking the errant hairs back in (I’m sure my tichel-only friends are much better at it than I am). With my sheitel, I don’t have to worry about it. With those sheitel clips in, that baby isn’t going anywhere. The ability to blend in (unless it’s August and I’m still in long-sleeves when everyone else is in tank tops and shorts). In locations with scant Orthodox presence, it’s nice to have a less conspicuous option. Doctor’s offices, DMVs, the airport, you get the idea. Well, there’s the price tag. They’re not cheap (though there is a fabulous sheitel consignment business here in Baltimore, and I have friends who have purchased sheitels through gemachs), and there’s not always a guarantee that spending $2K will lead to a good sheitel. Someone else has to style it for me. I tried to do it myself. Big mistake. I do not have that talent. Also, if you don’t like the haircut, it’s not growing back. When I’m feeling tired, I can’t really just plop onto the couch. I’m more reticent to lay my head down on a pillow when I’m wearing my sheitel. It’s not like I’ve never done it, but it’s just not great headgear for lounging. At the end of the day, I like my sheitels. I’m happy to cover my hair with them. They work for me. And when they don’t, I have other options, which I will discuss in part two. Stay tuned! What do you think about sheitels? As a fellow BT, I started to cover with the half-tichel look, advancing eventually to full tichel or beret. 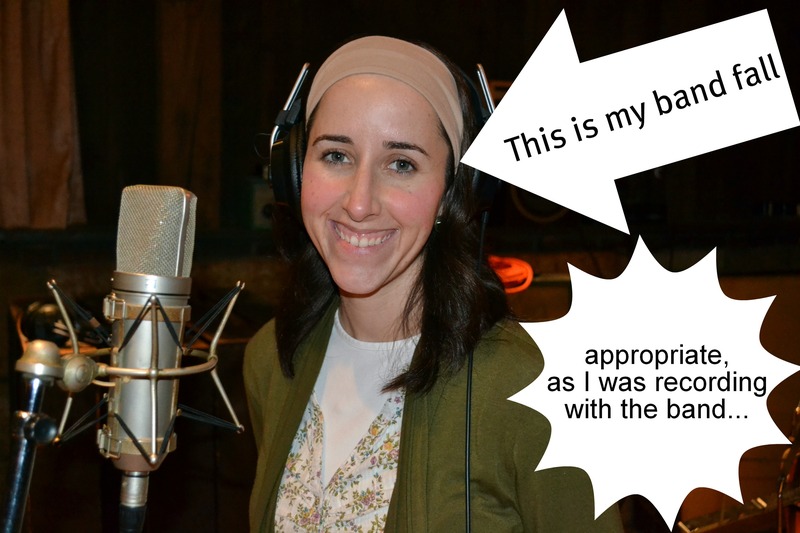 My husband then took on the minhag of Chabad, and though I tried a sheitel a few times, it felt very revealing to me and I couldn’t get used to it. Got a lot more looks from men — didn’t feel tsnius in it, and I specifically got a shorter one. While a few strands may peek out of a head covering, I feel much more tsnius in a tichel or beret, and I usually wear double head covering. I also feel like wearing a sheitel is such a responsibility as far as getting one that’s solidly tsnius, and — I’ll admit — I’m wary of tapering with my olam haba on this when I’ll have many other things to account for. I hear what you’re saying, though I think that whether it’s a sheitel or a tichel, there are ways of being tznius with it and ways of not. Kudos for being sensitive to it, and may you always have much hatzlacha in this mitzvah! Rivki! So interesting! Growing up, I watched my grandma pit on her wigs. I can’t wait to read Part 2! So nice that you have those memories! *put* She put on her wigs. And she was transformed! Magic! I would not want to wear a sheitel myself, but I enjoyed reading about your experience with them. I’ve heard that they are also great for going through airport security because you don’t have to take them off and put them on again. They are great in the airport, though I’ve heard that one has to be sure not to use a metal clip in their real hair, or it can set off the detector. I only use elastics to hold my hair up, so I’ve never experienced that. That’s fantastic that you had such a great experience, and lol on your husband’s time to put on his shoes! I have a close friend who unfortunately had a very negative experience in the Barcelona airport. She was wearing a tichel and when asked to remove it, she cited religious reasons. They responded “There’s no religion here,” and she had to take it off. May we all only have positive airport experiences! I flew from Israel to the States via Switzerland last summer and got a head-pat in Switzerland, but that was the worst of it. Of course, I do make my mitpachot kind of big in the back because I like the “full bun” look, so I guess I can understand why they felt the need to pat! It’s good to hear about positive tichel travel experiences. Yay! This is great Rivki!!! Good journey :) Your smile makes you beautiful no matter what headgear you choose. I wear a shaitel to work everyday, so on the weekends I don’t wanna even look at it! I wish they were easier to care for. I style mine by myself, but they would look better if they were professionally done. I can imagine that it comes off as soon as you walk in the door! And I feel you on the styling thing. This is why I take mine in so sporadically. I just can’t be bothered sometimes. Oh well. You mention that a sheitel is good for blending in, but that’s exactly why I love mitpachot. I like knowing that when someone sees me, he/she knows within one millisecond that I’m married. I also loved wearing mitpachot during a trip to the States and Toronto last summer, especially out in public (as opposed to shul or something). I’m not the same as the general public and I like that the way I dress reflects that! Take off your wigs ladies. Take your freedom back. Hi Rach, thanks for stopping by and for commenting. It seems to me that Rivki is doing a very good job of living and expressing her freedom (and with talent and humour, to boot!). We’re all entitled to our opinions, but I ask you, Rach, unless someone is doing something harmful to themselves or others, who are we to judge someone else’s version of the good life? Thank you, Rivki, for sharing your thoughts and experiences. Best wishes from Beautiful BC. I love that the head covering is a symbol of being married for your culture and religion. I highly respect the honor it gives to your G-d and your husband. I don’t believe as a previous comment says that it impedes your freedom at all. How rude. I’ve enjoyed learning more about you and your culture, Rivki. Thanks for posting. I can’t stand the sheitel clips! i never use the side ones, because they bother me, and the top one bothers me, too, so I’m always fiddling with it – and then I find out that the reason why I stopped fiddling is because I have a tiny triangle of hair showing at the top. Sigh. At least the tiny triangle tells people that it’s a wig, right? :D However, I have to say that it might not be the sheitel’s fault, because I have [a lesser version of] the same issue with tichels. One of my friends recently introduced me to the velvet band, where you wear this velvet headband under your sheitel, and you don’t have to use ANY clips, as the band keep your sheitel securely in place. I am totally getting one of these. What do you mean about the triangle of hair – do you meant that your hairline comes to a point in the front? Is this a special black headband, or any black headband? I want to try it! By “triangle of hair” I mean the hair right at the front of my forehead. It wouldn’t be an issue if my sheitel had bangs, but it doesn’t, so the hair in between the two sides shows a drop. It’s a velvet band, designed for keeping sheitels and tichels in place. Your sheitel macher should probably know about it. Thanks for all the information. I’m going to get my husband a nice sheitel for his birthday. Wish I had known about all the sales before Channukah. But he’s a great husband so I don’t mind paying full price for his modesty. I’m sure he will be the envy of every other husband at our shul. Hello Anne. You stated in the other post that your fundamental view is that others are to be respected. This comment certainly does not seem respectful, and any further disrespectful comments will not be posted. Thanks. You confuse respect and politeness. Politeness may dictate I not criticize your sexism and mistreatment of girls and women, But respect does not. Change would never happen if we were always polite. One need not refrain from criticizing all behavior or cultures. Especially those that we believe are wrong and harmful. The point still stands. My husband’s modesty is as valuable as mine both to me as his partner in life and to himself. Neither of us are harmed exposed by showing our hair. That is respect given and received. Your children deserve no less in their future lives. If Orthodox culture showed women respect, it would only require of them what is required of boys and men, for their heads to be covered. But there is little to no rational respect for women in Orthodox Judaism. Well, being impolite to me, a complete stranger on the internet, even if you vehemently disagree with me, is not an effective way to exact change. It just seems rude and snarky to me. It is common to confuse equality with respect. Orthodoxy acknowledges inherent differences between men and women, and the spiritual practices reflect that. If Orthodoxy required of me what it did of men, I would be obligated to daven with a minyan three times a day, lay tefillin, wear a tallis during prayer and wear a tallis katan underneath my clothing, among other things. Those are lovely mitzvos, but impractical for a women at my stage of life, as the mother of three small children. Someday, when my kids are out of the house, I hope to be able to daven regularly with a minyan. But I’m not obligated to do so, and I find that very freeing. Having lived outside of the Orthodox world as well as within it, my experience has been that I have been accorded more respect within Orthodox society. I think the acknowledgment of differences between men and women is a very rational thing. Are there people within Orthodoxy who are sexist and mistreat women? Absolutely! Are there people in general society who are sexist and mistreat women? Absolutely! I would rather my daughter grow up in a society where they are not encouraged to dress provocatively while they are tweens. I expect that you will still disagree with me, and that is your choice. But know that as someone who has chosen to live in accordance with halacha, I find Orthodoxy neither irrational, sexist or disrespectful. I am happy to explain to you why I have made the choices I have made, and why I find living according to halacha a fulfilling and beautiful life. But it would be much easier to do if you the discussion were more, shall we say, civil? Hi Rivki I am not Orthodox, but my son’s Bar Mitzvah will be held at a Chabad Synagogue, on a Monday morning. I do not wish to “deal with” my very challenging, very curly hair for the Bar Mitzvah, it is very hot and humid where I live, and an attempt to subdue this hair would be useless. I have many wigs for this reason. I was planning on wearing one of my shorter shoulder length curly wigs. Is this appropriate for me to do, even though I am not Orthodox? Everyone there knows that I am not and I hope to not look like I am trying to “pass” as Orthodox. Or will it be respectful to fix my hair this way? Also I am stumped about what I could wear. I have a neighbor (not Orthodox) and she also had her son’s Bar mitzvah in an Orthodox Synagogue and she wore her long hair out, a multicolored chevron designed bell shaped sleeve dress (what I would perceive to be loud) and the dress was above the knees (what I would perceive to be inappropriate) I am not gossiping or insulting her but when I saw what she wore I was shocked and felt I could not dress that way to an Orthodox Synagogue, although I have no clue what to wear, or anyone to ask. Any suggestions would be greatly appreciated! Thank you. Hi Tess! Mazel Tov on your son’s upcoming bar mitzvah! That’s very exciting! Kudos to you on being sensitive on what to wear. It sounds like you already have an idea of what would be a respectful outfit. In general, some parameters are a skirt below the knee, 3/4 sleeves and a relatively high neckline. Kate Middleton usually has good modest style, if you want some visuals. I’ve always found Lubavitch women to be very approachable (and fabulous), so I’m sure if you called the Rebbetzin of the synagogue she would be happy to help out. If you don’t have her number, you could probably call the synagogue’s office and ask for it. Mazel tov again, and if you have any other questions, please don’t hesitate to ask! This was a nice article. I’m orthodox, but honestly struggling with the sheitel part. I’m very recently married. I’ve been using hats (more like a knit cap) but in Florida, most of the time it is so hot that that won’t be a solution once the heat and humidity return. I worry that a sheitel will be so incredibly hot as well. Plus, I want to look professional when I begin work, and again, a scarf or knit cap, I don’t feel will look very professional. Also, at my old orthodox synagogue, there used to be a professor that was an expert on Sefardic history. He gave a lecture on how the sheitel is not a proper covering, only scarves are. He covered the history of it all. It was fascinating. He did not do this to be malicious, just to pass on the information. Needless to say, nearly all of the women were not happy with him. But again, he was a brilliant man and his intent was not to be mean, just loved history. Was it easy for you to just put the sheitel on? Hi! You are not alone in your struggle with covering your hair. While I personally didn’t have a hard time with it, I have friends who do. We all have some mitzvos that we find more challenging than others. Absolutely. Vis-a-vis professionalism, you might be surprised to find that people can be accepting of scarf-wearing in a professional setting. Usually we are more self-conscious of our Jewishness than we need to be. Religious convictions like covering your hair are something which can earn the admiration of your co-workers. I can imagine that it wasn’t the most popular lecture topic! But history certainly is fascinating, even if its not what we want to hear. I have close friends who are Sephardi, and no, they don’t wear sheitels as a rule. Also, check out the site Wrapunzel. She has some really beautiful ways to cover your hair there, and is a wonderful woman to boot! Hi! I live in FL too (Miami) and I can’t wear wigs for long. I wish there were a way to. Have you heard of the wunderwig? I don’t have one, but I have friends who do and they say it is very very light and breathable and not hot. Maybe that’s an option. Let me know if you want me to hook you up with someone in Miami who sells them. Little Shop of Goodness: Do you remember the name of the professor? Also, with what school is he affiliated? I would love to see if I can find any of his writings or audio. Hi Jennifer, sorry it’s taken me so long to reply! It was professor Dr. David Fintz Altabé. He passed away in 2008. He was a great man, intelligent, kind, and caring. Temple is not the same without him. I forgot which university he taught at, but here are a few links. I recently moved to Brooklyn and live in a neighborhood that has a large Chasidic population, though not quite in the part I live, which is more Afro-Caribbean. There were not a lot of more orthodox Jews (or black people for that matter), where I grew up, so I am trying to learn about all the new cultures around me! I am finding orthodox Judaism very hard to understand. As a non-believer, I don’t appreciate that my Chasidic landlord can’t shake my hand when we do business because I am a woman. I want to respect his beliefs, but that seems like a very sexist rule to me. I also don’t understand regulating how people dress, but I’m trying! If wigs look like real hair, what is the point of covering your hair? Isn’t it still tempting to men if they THINK it’s your real hair? (I thought covering arms and hair was to prevent tempting men, but maybe that’s just a stereotypical outsider view, so please enlighten me if there’s another reason!) (I’ve always had short hair and I think long hair is gross so I might also just be weird.) Anyway, I love the look of a scarf wrapped around the head. I think it can be very elegant and I have done this a number of times for “fashion” over the years before I knew it was a Jewish thing. Is it offensive/cultural appropriation? Also, what are your thoughts on Jewish girls who dress fairly tsnuis but only “cover their hair” with a headband? What’s the point of that? Hi Chelsea! Thanks for the excellent comment! I can understand how your landlord’s refusal to shake your hand could be off-putting. The reason he won’t (and the reason I don’t shake hands with men) is based in the Jewish recognition of the potency of touch, and it’s power to develop connection. The practice is called shomer negia. I remember reading something about a study done which showed that a waiter who touches a customer lightly on the shoulder will generally receive higher tips that one who refrains from touch. So because touching creates connection, Judaism advises us to save it for those of the opposite gender that we have the closest connection with: husband, father, brother, grandfather. This helps keep the connection special, and dynamic. It is also is extremely useful when dating, because, you know, touching feels good, and that can make a otherwise unsuitable guy seem much more appealing than he really is. Gila Manolson wrote a book on that topic called the Magic Touch. The regulation in dress is a concept not really found in general American culture these days. It can kind of be understood in the context of the first lady having a certain required dress at formal events, or anyone eating at a fancy restaurant. There’s a level of dignity that comes with dressing according to certain standards, and that’s a big part of why Orthodox Jews dress the way they do. On the topic of covering up to not tempt men thing, I wrote a little about it in this post. As for the covering hair with hair thing, that is a GREAT question. There are sub-groups within Orthodoxy who do not use sheitels to cover hair because it does seems to be problematic re: modesty. But a large portion of Orthodox Jews *do* wear sheitels, and there is a well-established leniency to do so. My understanding is that when a woman gets married, her hair takes on a different spiritual status (this is all kabbalah stuff which I have not formally studied), and so just covering her actual hair fulfills the obligation. That said, it is definitely preferably to wear a more subtle, conservatively styled sheitel to a va-va-voom one. As for the girls who only cover their hair with a headband, I’m going to refer to the “two Jews, three opinions” stereotype. There are many different viewpoints on hair-covering, and each women should really consult with her own local Orthodox Rabbi to understand the mitzvah in the context of her own spiritual journey, her community and Jewish law. Feel free to rock a scarf whenever you want. Orthodoxy doesn’t have exclusive rights to that style, and I don’t think anyone normal would find it offensive. If you ever have any questions about Jewish stuff in the future, don’t hesitate to ask. You can email me at married lane (at) gmail (dot) com, anytime. Wow I loved reading your post! My name is Samantha, I’m 16. My best friend, Whitney, is in her 20’s and got married last December. We are both strict Messianic and she started covering her hair full time after her wedding. I started head covering in February (I’m not married) but in my area I’m the last single female and there are quite a bit of guys around that are Torah Observant so they often like to chase, and of course those pesky town boys…… and apparently really really long hair (like hair you can sit on….) is really attractive. (who knew!) So I really have a problem keeping any guys away. I also would get many stares from men so I felt led to cover my hair for ‘modesty’. My mother has covered her hair with Snood’s since 2008. Whitney does mainly Tichel’s. So I followed suit lol. I LOVE Tichels!!! I’ve collected so many scarves and accessories over the months. I also use a velvet headband while wrapping and its such an amazing invention. And I love checking out Wrapunzel. I live in a small town in Texas, I have no problems with the local’s with my wraps. I’ve never been asked to remove it (and actually had to). My driving permit and Texas ID both have ‘Tichel Photos’. I flew back in April to Houston. I never had to remove it nor got any pats on the way down there, but on the way back I chickened out going through Houston’s security I threw on a beanie. (I do wear some snood’s sometimes when I’m in a hurry or have a major headache; but I also will wear your average beanie or beret as a snood so it’s not as noticeable and I just tuck all my hair up in it.) Anyway, My mother, Whitney and I are all going on a vacation at the end of May and will be traveling out of state so we would like to wear a Sheitel while traveling through the airport. (like I said, here locally I have no problem, my mother and Whitney also work at a large head bank corporation with security and they wear snood/tichel everyday with no problems.) But for going out of state and for the sake of flying for many hours (Tichel people that add the volume know how uncomfortable it is sitting in a seat), anyway we really would like to wear a Sheital. So my questions…. lol. (I talk a lot I’m sorry.) We have no idea where to start. Is there any specific rules to follow on picking a Sheitel? (We know its still a controversial headcovering, some rabbi’s approve and some don’t, so we couldn’t really find anything on this is how your sheitel should be kind of stuff) We checked out Sheitel.com and were blown away by the prices. Could you explain why a regular wig wouldn’t work? or would it? Should we get synthetic hair or real hair? Is there a preferred Sheitel length/color? Whitney went to a Chabad restraunt on her honeymoon, and the ladies wore Short Black Sheitels (Which we can understand as blonde isn’t considered as modest by some, and short black isn’t all to attractive. )But we are confused as we saw some online in all different lengths…. so we are confused lol. Basically we know we want to wear a Sheitel…. but we have no idea where to start to get one. Any advice or tips you would give would be greatly appreciated!!!! Hi Samantha! Sorry it took me so long to get back to you about this! If your main concern is the volume issue, have you considered wearing a more simple wrap? You could get a pre-tied tichel (like from here) and wear your hair in a low pony/bun, and that is a fairly comfortable way to travel. I’m not sure where you’re traveling, but if you’re not having a problem with covering your hair where you are now, do you have a reason to believe that there would be problems where you’re going? You might be pleasantly surprised to find that it’s no problem at all and you don’t even have to worry about getting a sheitel! If you’re really set on traveling with a sheitel, I would just get a synthetic one. The ones made with real hair are more of an investment item, due to cost, and I would only recommend getting one if that is the hair covering you are planning on using on a regular basis, not if it’s just something to be used for a short period of time. As far as color, I would get one that most closely matches your hair color. For length, staying above the shoulder is a pretty non-controversial length. Good luck, and feel free to ask if you have any more questions! Our Rabbonim will have no problem if all the Jewish women decided to upgrade from sheitels to the traditional cloth coverings that our imahot wore. This will speed up Moshiach’s coming tremendously. I love reading debates about hair covering. It’s one of the most important mitzvot we have, I think. I’ve worn a sheitel, and liked it (although I was sneered at for it), but I’m troubled by the concept of being, as you put it, *incognito*. Where I live currently, there is no community at all. I have, at times, used a tichel (LOVE wrapunzel!) but I stood out like the proverbial sore thumb, which I figured wasn’t very tzniusdik. I’m not covering atm – I’m a widow, so technically I don’t suppose I need to, but I want to – but I’m considering a sheitel again. I work on reception in a holiday resort, so a tichel wouldn’t go down very well. I can usually tell a sheitel when I see one, and I’m not sure I hold with the view that sheitels can be more attractive than one’s own hair. That kind of seems to miss the point. I don’t see the laws of modesty as restrictive at all. The society we live in encourages everything (and I do mean everything) to be shared with the world, and that our bodies, and sexual attractiveness, are the only currency women can bargain with. Women are just as bad as men for reinforcing this societal norm, too. That makes me so sad! In contrast to the previous comments about freedom, the pressure to be attractive to all and sundry makes me feel oppressed. If I’m not *gorgeous* as the world decides the term, I have no value. How can someone feel liberated by that?? Tzniut makes us feel special and our husbands feel special, because what we share is only for them, not for the world and his mates. Also, let’s not forget that tzniut applies to men as well. They can’t lounge about at home, or go out in vests and shorts. I really wish guys wouldn’t do that. It’s wonderful to read blogs and articles by women who are clearly strong, proud and intelligent, arguing the case for tzniut and hair covering. Sorry, I have an allergy about men, or women, telling me what I may or may not wear as modest. When I go to shul I wear an embroidered kipah and a skirt. The rest of the time I wear trousers and a short sleeved top, not low cut. When I visit the Haredi areas of London to buy Pesach food all I see are men in Polish garb and women dragging dozens of young children around in long skirts and fed up expressions. Although I was brought up as an orthodox Jew, I am happier as a Reform one with the same rights and duties as any other person. Many of my fellow congregants have also come from orthodox backgrounds but we sit together with our families which, to me, is what I want. I am happy for those who want to wear sheitels etc and find pleasure in it but it is not for everyone. I prefer to be an equal in both my secular as well as my religious life and do so with pleasure. If you don’t mind me asking, why do you wear Sheitels or coverings when your husband is home? If it is only the two of you relaxing at home, wouldn’t it be acceptable to go uncovered? I am not Jewish, just a woman with alopecia who wears wigs every day and is extremely curious about the varying religious reasons to wear wigs. Hello Jewlia! My apologies for taking such a long time to respond! You are correct that it is totally fine for me to walk around my house with my hair uncovered around my husband, and I have friends who do that. I wrote this post many years ago, and now that my kids are bigger, there is a lot more traffic in my house (other kids, other parents dropping off kids, etc. ), and I am also in and out of the house much more frequently for carpool and to take my kids to extracurriculars. I would find it a hassle to constantly be covering and uncovering my hair, and also, I wouldn’t want to have to run for a head covering every time there’s a knock on my door (which is pretty frequent!). But even when my life was calmer, I still preferred to have my head covered all the time. I’m sure part of it is inertia, just easier to leave something on my head and not have to think about it, but a part of it is also that I enjoy covering my hair, it brings me comfort and feel kind of naked without something on my head. Thank you for your kind response! I understand, even though I do not have hair, I still like to keep my head covered at home (even with a beanie, if not a wig). It definitely instills a certain level of comfort. I have a quick question. Why do you cover your hair when your husband is around? I’m Fundamental Baptist and we UN cover in front of our husbands. I’m interested in understanding your ways. Hi Susan! The main reason I cover in my own house is because I never know when someone is going to knock on the door and I don’t want to have to scramble for a head covering each time someone I’m not related to comes to the house. In the privacy of our room, or late at night I will occasionally walk around uncovered, but I’m so used to being covered that I prefer to have something on my head. Plus in the winter it’s nice and cozy and warm.